As a consequence--if you don't add any kind of soundproofing, noise travels easily from apartment to apartment by a network of wood, which allows you to enjoy the sound of your neighbors walking, opening and closing doors and drawers, blowing their noses, talking, and more than you'd ever want to know about them. It doesn't matter if they're above you, next door, or below you -- you can hear all of these things from any direction. After time, research, and the infusion of new products into the marketplace during the last four years, I'm slowly adding and revising things in my flat, which has given me an opportunity to experiment with products. I didn't know what would work and what wouldn't, so I've done a little at a time. One of these products was QuietRock drywall. 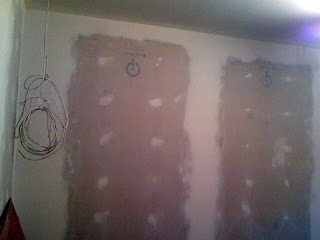 In these photos, you'll see where I removed the original gypsum on two walls of a room -- one of them is an exterior wall, which touches the building next door -- and replaced them with 5/8" QuietRock 525. 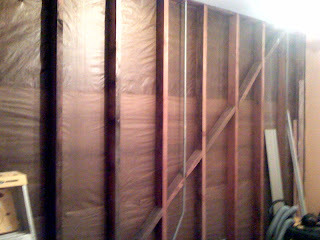 These two walls didn't have the blown-in cellulose in them earlier, so I added CertainTeed fiberglass batting between the studs before adding the QuietRock. I wish I'd known at the time about sound-isolation tape, which you can apply to the studs before you add new drywall, because I bet that dampening would have helped, too. Anyway, as a result, I've reduced quite a bit of incoming noise, and I know that a lot of my own activity -- particularly talking and music -- is not going out of the room from these walls. There are some mysterious noises that still pass through. The guy in the building next door tends to pound and bang on his adjacent wall, and I can hear that. I have no idea what he's doing, and thankfully, it doesn't happen all the time. His building touches mine on the outer wall that you'll see in one of these photos (the one with the waxy paper between the studs). 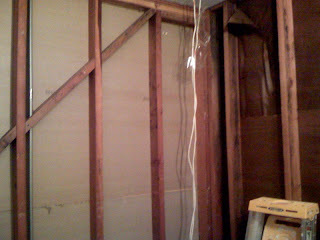 Look at how shallow the wall is -- and imagine it with only a piece of 1/2-inch gypsum board on top. That was all that separated me from the outside world, or in this case, the building next door. 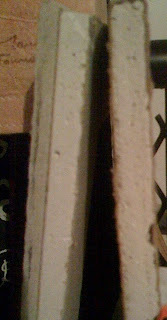 I'm also including a photo that I took of a cross-section view of QuietRock 525 to show it side by side with a piece of 1/2" gypsum, so you can see the difference in thickness and materials. The QuietRock 525 is on the left side. There seems to be a layer of concrete or something on the QuietRock, which is fused to regular gypsum. After the photos, you'll see the commercially produced "testimonial" video (not mine) that was apparently on TV.